-Have two players, one soccer ball, and a gate. -The player has to pass the ball betwen the gate. -Using the correct part of the foot. -Have a competition betwen team. -Each player has a ball. -To start they first dribble towards the goal to set up for a shot on goal. -Once the keeper attampts to save the shot, they must get back up quickly to turn and face another attacker stricking on goal. -Angle of approach is off center. -Head up to observe position of goal keeper. -Head down at the point of contact. -Follow through landing on stricking foot. -Add pressure from player in line chasing the attacker. -From one goal, still playing the same game but this time a 2v1 and keeper game. -Allow players to dribble closer to the goal before striking. -Player pass the ball to player B. 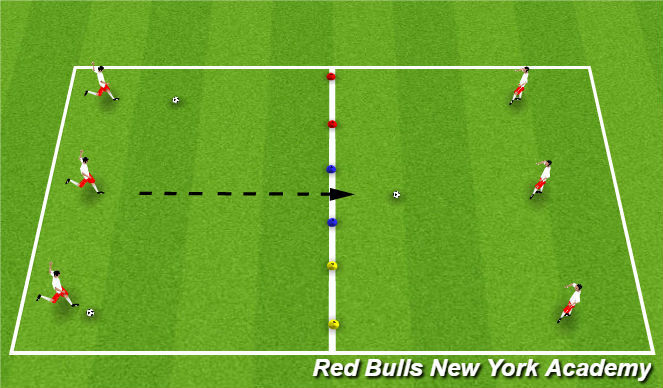 -Player B has two touches before to shoot to goal. -The first player to score 3 goals win. -Choice of technique based upon distance, position of the GK. -Non-kicking foot placed to side, slightly behind the ball. -Add a defender when difender wins the ball to score on the small goal.